Since 1996, Glasgow Chess was very poorly represented and our belief is that this genre has a lot of potential. 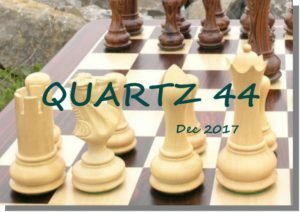 So, we are launching a thematic tournament, Quartz TT11, for problems with Glasgow Chess rules. The tourney has two sections: a) fairy problems; b) retro problems. In both sections, combinations with other genres, fairy units, are allowed, but Vielväterstellung problems are not allowed. The closing date was mistyped, should be July 1, 2018! The move 6…Be7 can also be played 1 or 2 plies earlier. This cook was found using the upcoming version of Jacobi which will support All-in Chess as a condition. Good job, Francois! I know some good All-in-Chess problems waiting to be verified. According to Jacobi, both part (a) and (b) are cooked by mates using the move 2…Bd1#. Fix: Add white pawn on e2 and black pawn on e3.